BSX Records in Association with CERBERUS RECORDS will be releasing on the first time on CD, A TIME TO DIE. The soundtrack features music composed and conducted by Ennio Morricone (The DOLLARS Trilogy, THE MISSION, CINEMA PARADISO) for the 1982 dramatic film directed by Matt Cimber, from a story by Mario Puzo (THE GODFATHER), with an impressive cast that includes Edward Albert, Rex Harrison, Raf Vallone and Rod Taylor. Set in the final days of the Second World War, A TIME TO DIE tells the story of Michael Rogan, a young American revolutionary (Albert) who loses his wife and comrades in a Nazi raid on her village. After being left for dead by the cruel Colonel (Harrison) responsible for the massacre, Rogan goes on a quest for vengeance after the War is over, killing off his former German captors, one at a time. 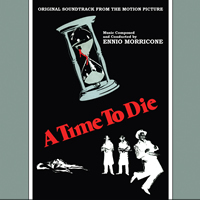 A TIME TO DIE features music composed by the great Ennio Morricone, here continuing a creative relationship with director Matt Cimber that included two other films, BUTTERFLY and HUNDRA. Born in Rome on November 10th, 1928 , Morricone studied at Rome 's Santa Cecilia Conservatory in his formative years, where he specialized in the trumpet and composition. Although his name will always be synonymous with the Spaghetti Western, Morricone has also contributed to a huge range of film genres, making him one of the film world's most versatile artists. He has written nearly 400 scores for films such as THE GOOD, THE BAD AND THE UGLY, BATTLE OF ALGIERS, ONCE UPON A TIME IN AMERICA, THE MISSION, THE UNTOUCHABLES, BUGSY, CINEMA PARADISO, and many, many others, not to mention his legendary collaboration with Sergio Leone across six films. He has been nominated multiple times for Oscars and Golden Globes. He is the winner of several Golden Globes and finally received an honorary Oscar in 2007 for his magnificent and multifaceted contributions to the art of film music. BSX Records presents the original motion picture soundtrack to A TIME TO DIE, featuring music composed and conducted by Ennio Morricone. While the film also contained additional music composed by Robert O. Ragland, this release only contains Morricone's contributions to the film. As the masters no longer exist for A TIME TO DIE, this release has been mastered from mint stereo copies of the original Cerberus Records vinyl release for its first time release on compact disc. A TIME TO DIE is a limited edition release of 1500 units.